Assuming shipping volume is the metric of success, this hypothesis has been correct thus far. Regardless of what one thinks about Android the platform or its various hardware instantiations, what’s not arguable is that it is a success as measured by volume. The question for Google, Android developers and competitive platforms is whether this is sustainable, or if there are cracks in the foundation that will slow the above trajectory moving forward. For the coming holiday season, Android has several new handsets that are certain to be positioned as legitimate iPhone 4S competitors: the Samsung manufactured Galaxy Nexus, the Motorola Droid RAZR and the HTC Rezound. Besides being Android vehicles, all of these handsets have one thing in common: they’re all being released on Verizon. Granting that Verizon is the largest carrier in the US, the merits of this strategy seem questionable if the goal is maximizing the addressable market for Android. One or more should have been simultaneously shipped on AT&T, the second largest network, or at least on second tier players like T-Mobile or Sprint. It may yet come to pass that one or more of these handsets ship on a carrier competitive with Verizon – details of carrier coverage and availability have been scarce, itself an issue – but time is a factor during a busy holiday season. The limitations of this handset clustering must be obvious to Google, which means that either they are unable to exert sufficient control over the manufacturers and carriers to maximize their penetration, or that the carriers have incented Google sufficiently financially to make a tactical sacrifice. Neither possibility is encouraging, for Google or users of the Android platform. Google’s attitude towards fragmentation has been consistently dismissive; top to bottom, the organization has been willing to trade API consistency and compatibility for rate of innovation. And as discussed above, this strategy has been successful. That said, as the platform iterates the versioning and thus fragmentation challenges multiply. Michael DeGusta visually depicted the challenges Android developers and users face with respect to fragmentation. This problem can only be expected to get worse, as versions proliferate and the carriers who are incented to not update their users remain responsible for operating system distribution. Amazon’s effective fork of Android, which will underpin its Kindle Fire tablets, is likely to further complicate an already problematic developer story. Google’s promised solution to this problem, meanwhile, has yet to show material benefits. Google is obviously not responsible for our fundamentally broken patent system [coverage], and it is to their credit that they have been as publicly outspoken against patents as they have. But their historical lack of focus on intellectual property accumulation has proven to be, in retrospect, a mistake. Fair or unfair, the current patent system is the current market reality. Worse, there is little evidence that we will see a solution within the projectable future, but substantial reason to believe otherwise. While Google has employed a variety of mechanisms to address this strategic shortcoming – from discrete patent purchases to accumulation by acquisition to combat via partners – the perception is that they are losing. Building the case otherwise is challenging with the Microsoft claim that over half of Android OEMs are paying an intellectual property tax to Microsoft. 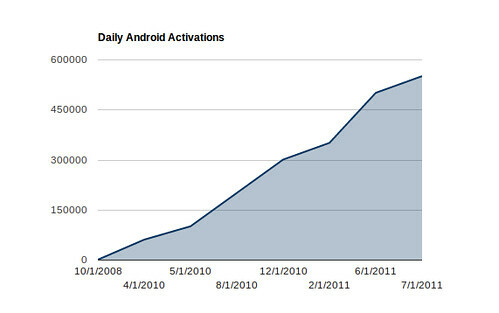 Android is far from the only player to have patent issues in mobile, to be sure, as this graphic indicates. But they may have the most to lose. When the Xoom launched, the Android Market contained a mere 16 tablet specific applications. According to market.android.com, in the eight months since, they’ve added 150 new tablet applications, yielding a growth rate of 940%. Which sounds positive until you realize that the iPad more than doubled its 65,000 application catalog, which is now 140,000+ strong. To some extent, this is unsurprising. Application generation is typically a function of adoption; as DiBona asserted above, there is a linear relationship between hardware shipments and developer interest. With Android tablet shipments anemic at present, in spite of Google’s efforts to seed the markets at events like I/O, developer interest could be expected to lag. What is curious, however, is Google’s inability or unwillingness to get key, flagship applications ported to the platform. Nearly three quarters of a year after the official release, there is still no tablet-optimized official Twitter client. Ditto for Facebook, although they were inexplicably late to market with their iPad offering. MLB initially promised a tablet optimized version of their At Bat application similar to what was available for the iPad, but never delivered it. So while Android has had notable wins like the NFL ’11 application for the tablet form factor, it remains tens of thousands of applications from being competitive from an applications perspective. The question is why? Apart from the obvious answer in hardware volume, some of the explanation may lie in developer trepidation around the nature of the Honeycomb platform. With Google admitting that it took shortcuts to get Honeycomb to market in time, some developers may have chosen to wait for the unified Ice Cream Sandwich platform. But it remains curious that Google hasn’t been able to incent – financially or otherwise – key application partners to make the platform more compelling to users and potential developers. With application availability proving to be crucial to the iPad’s ongoing success, it will be critical that Google resource itself appopriately to remedy this issue. That’s about right. But what can you do about it? I mean, yeah they were late to the patent party, didn’t take them seriously right off. The article should offer what you’d do if you were there now. The concerns are obvious the solutions less-so. Quick points as, ironically, I’m on a mobile. 1) America != the world. Who cares if a phone is exclusive to one carrier in one region? 2) Tablets are a niche. While I don’t want to say “there’s a world market for maybe 5 computers” – how big and important a sector can it be. Perhaps the reason people aren’t porting is the high dev costs & low returns they’re seeing with iPad? 3) Patents are a manufacturer problem. Whether a manufacturer was using Android, Bada, Win7, or something home cooked, they’d be infringing *someone’s* patents. That’s the cost of doing business it seems. Is everything rosy in Android’s garden? I doubt it. But these seem like fairly trivial nits to pick. 1) Agreed. But the US is a major market, and the home market for the platform in question, so I’d argue that it matters. 2) The iPad business alone is a Top 1/3 Fortune 500 entity (http://www.nytimes.com/2011/01/30/business/30unbox.html). It’s difficult, therefore, to build the case that it’s a niche, unless you’re arguing that the iPad isn’t a tablet. 3) Patents are fundamentally broken and have been for decades (e.g. this patent for toast: http://www.patentgenius.com/patent/6080436.html). 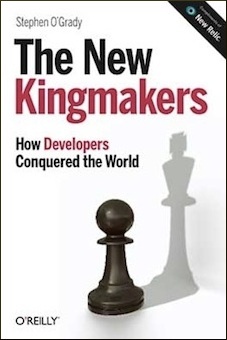 This has allowed entities who perceived value in this system to accumulate a wealth of resources, which makes their ability to both defend themselves and attack competitors asymmetric. Google, in other words, is poorly equipped for this fight at present. But as you point out, the litigation is generally aimed at manufacturers rather than software suppliers. Which is exactly why vendors like Apple and Microsoft are either seeking injunctions against the units in various geographies or extracting a tax from these suppliers even when their products are not involved. This is the cost of doing business, as you say. The danger for Google is that at some point that the costs exceed the profit for suppliers. 4) It’s not all doom and gloom for Google; they’ve done spectacularly well from an adoption standpoint. But there are real problems which, if left unchecked, could threaten their current growth. So is UI polish, design, etc., not listed here because you think it is good or because you think it isn’t really relevant despite being bad? 1) I think it generally falls into the category of “good enough,” and in some cases betters the iPhone (e.g. notifications). 2) It’s not a systemic problem in the sense that patents, as an example, are. UI design is entirely within their ability to solve; the same cannot be said of the other examples on this list, for the most part. OK, damn near every sentence in this post is wrong. I can only assume that somebody hacked redmonk.com and posted this. I think we’d agree that – with the exception of in between devices like the discontinued Dell Streak – handsets and tablets are different form factors. My Xoom, as an example, has substantially more pixels available than my Nexus One. An application designed for one, therefore, may not be designed for another. Consider the difference between the iPhone and iPad Twitter or MLB At Bat applications, as an example: they are each built specifically for the device. So while the native Android Twitter client may work on my Xoom, it doesn’t work well because it wasn’t designed for it. As for the 16 applications, that’s directly from the Android Markets tablet category. As of yesterday, the “Featured Tablet Applications” tab on the Android market had 166 items in it, up from the 16 previously mentioned. Are there more applications that will run on a tablet? Certainly. But as a user of the device, the experience of using blown up handset applications is suboptimal; and the “zoom” feature introduced in Honeycomb was essentially unusable. Ice Cream Sandwich will solve some of these problems by making it easier to resize user interface elements dynamically, but the fact is that that, by itself, won’t solve the problem. When the device is sufficiently distinct, it’s important to design for that. Let’s say, however, for the sake of argument that there are 100X more tablet specific applications than I’m allowing for using the Android Market metric. That makes the number 16,600. That gives the tablet roughly 12% of the current iPad application catalog, all of which are designed for that platform. Happy to update the piece: can you point me to a tablet optimized application that isn’t in the featured tablet applications category?